This post is adapted from the Center for Online Education, a Priceonomics Data Studio customer. Does your company have interesting data? Become a Priceonomics customer. We wanted to understand the emergence of online options at universities with long histories of on-campus instruction. 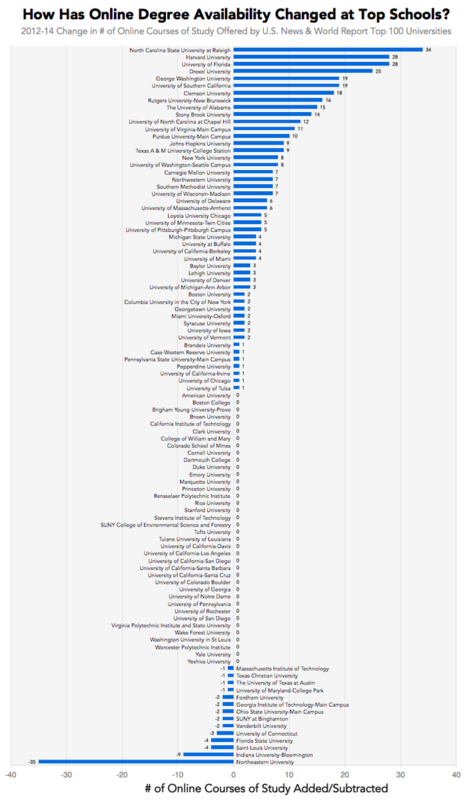 So, using data from Priceonomics customer, the Center for Online Education, and the U.S. government's Integrated Postsecondary Education Data System (IPEDS), we looked at recent changes in the availability of online degrees at nonprofit 4-year colleges and universities. 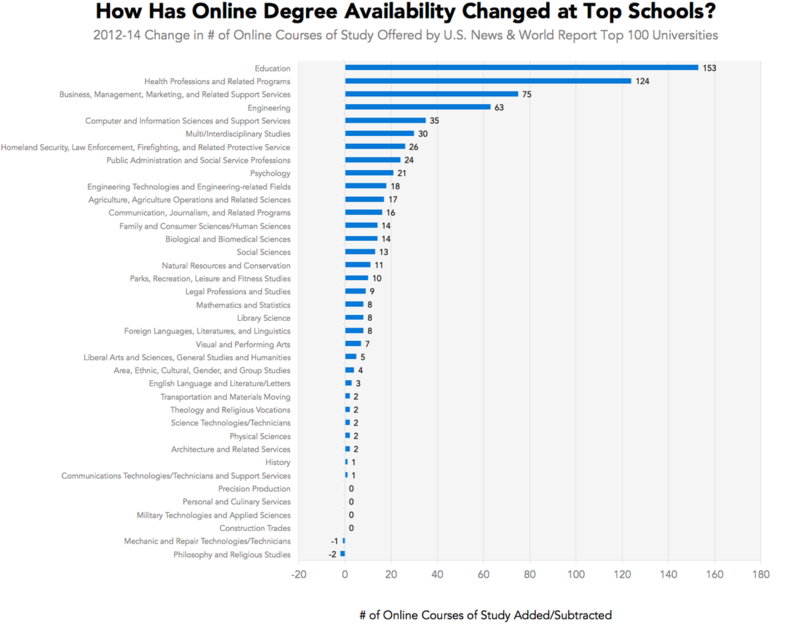 We began our analysis by examining how many schools offer at least one online degree program. 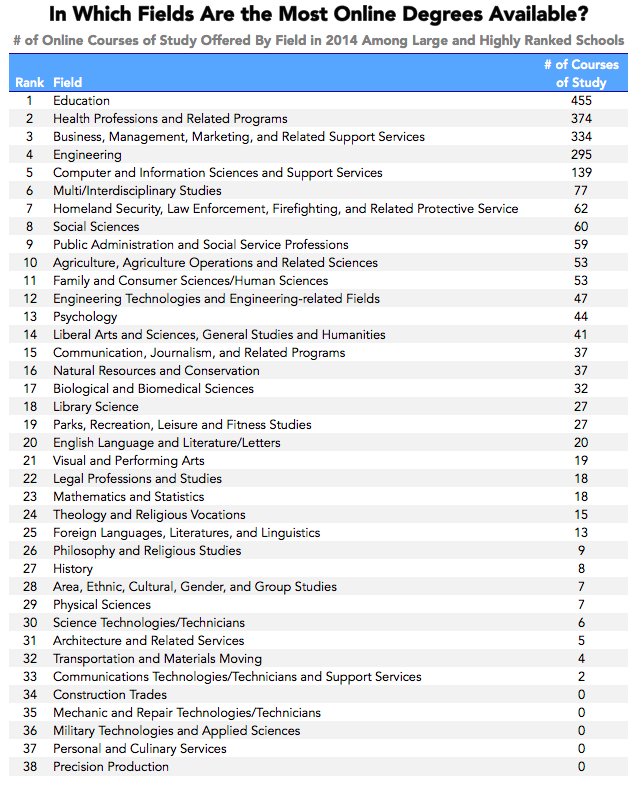 We only looked at nonprofit colleges and universities in the U.S. that primarily award bachelor's degrees -- a set of 1,844 institutions in total. We focused on the time period between 2012, when the government began to collect comprehensive data on online education, and 2014, the most recent year for which a complete dataset is available. 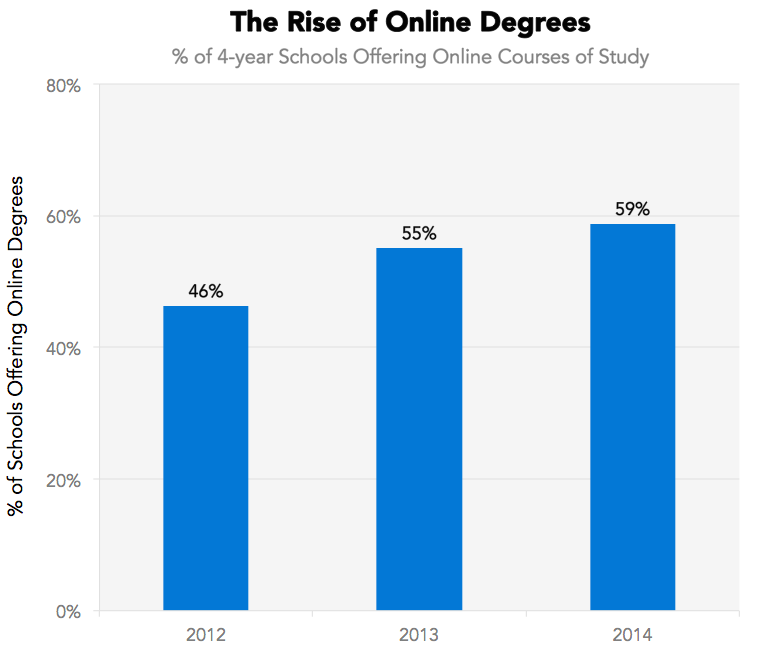 Just over half of the 20 schools with the most online degree programs are public universities -- online education is well-suited to help state schools carry out their mission of increasing access to education. 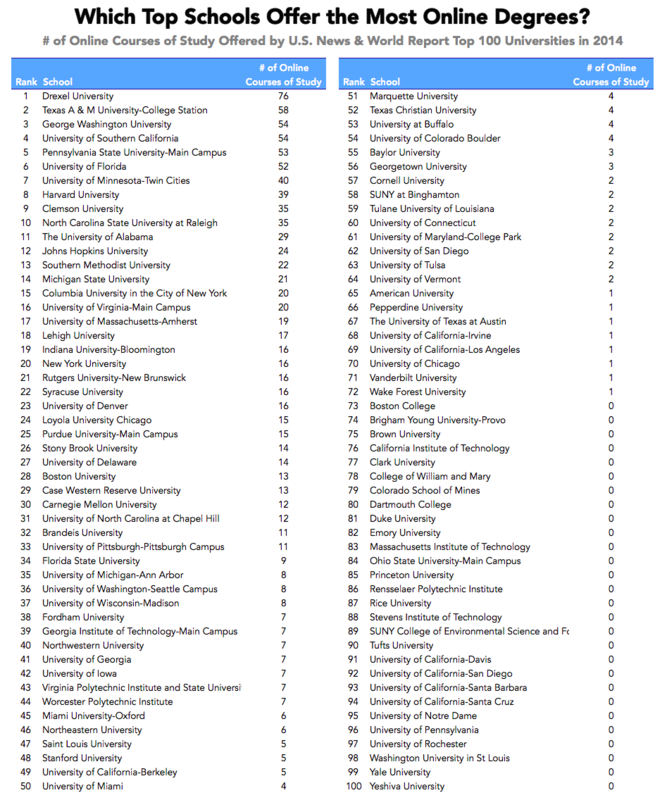 But online education isn't only for public institutions, as 9 of the top 20 schools on this list are private universities. Three of them -- Harvard, Columbia, and Johns Hopkins -- rank among U.S. News & World Report's top 20 universities, indicating that learners can now earn online degrees from among the most prestigious schools in the world. At the top 100 liberal arts colleges, however, only four -- St. John's University, the University of Richmond, St. Thomas Aquinas College, and Willamette University -- offered any online courses of study in 2014. This is likely owing to the liberal arts emphasis on providing intimate learning experiences. 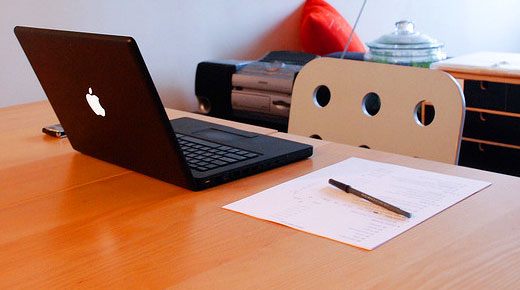 The range of disciplines online students can study is broadening too. Colleges offer online degrees in fields that have long been served by distance study, like business and health professions, but also in specialities like biological sciences and visual and performing arts -- subjects that once seemed impossible to learn from a distance. Daphne Koller, CEO of the online education platform Coursera, routinely makes headlines when she suggests that online degrees will become commonplace. But our analysis shows that future may already be here. The headlines -- and our conception of what higher education looks like -- just needs to catch up.